I was reminded last week (thanks, Kira!) 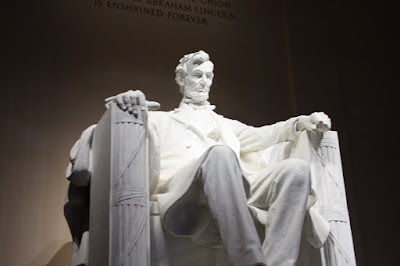 that I promised you a report on our Washington DC trip. I was also reminded that I failed to deliver. Not that I was busy or anything last week with the P's in town and kids starting school. So, in honor of Kira, whom I love and who will probably be taking DC by storm next year, here's a bit of a recap of our trip to the nation's capitol. We arrived in DC in the afternoon and even though we had sketchy at best excellent directions from good old Mapquest, we found ourselves veering off course which, of course, led to the following interaction. Me: I think we were supposed to go the other way on that street back there. B: Why didn't you tell me? Me: Well, the roundabout was confusing. B: Just tell me where to go now. Me: Turn left. Like, now. HERE!!! B: I'm in the right lane, Shelly! How can I turn left here?!?! Me: O.K., don't yell at me. Turn left at the next street. B: Which one? This one?! DO YOU WANT ME TO TURN LEFT NOW? B: You're going to get us all killed! Me: Don't yell at me! And on it went until we finally reached our hotel where we pulled up to the valet and tried to look like a family that had it all together. Even though not two minutes earlier we wanted to rip each other's heads off. Kids included. We spent four nights at The Melrose which, to me, is in a perfect location. Very close to Georgetown. Just a few blocks from a Metro station. Within walking distance to the White House. And right around the corner from Trader Joe's (so I felt right at home). The hotel is a little older and in need of some updates, but for the special price we got ($89 a night--thank you, Travel Zoo), I was willing to put up with, well, a lot. Besides, I had called earlier and asked for a double room with a pull-out sofa and they graciously obliged. Our room was the size of a small apartment! We were most comfortable. I had made reservations to do a biking tour on Monday night, and let me tell you, this tour was one of the highlights of our trip. If you're going to DC with your family, definitely do this. I found Bike the Sites on the internet before we left (just proving, once again, that doing your research ahead of time is priceless). Our tour was a three hour tour (NOT of the Gilligan variety!) of the monuments, covering about 4 miles total so the ride was easy for all of us. We started out at 7:00, so it wasn't dark yet, but by the time we were about halfway through it got dark. By the time we finished it was about 9:45 and completely dark. Kind of fun to be riding the streets of DC in the dark, I thought. Anyway, this is THE BEST way to see all the monuments. I had no idea they were all so far away from each other--as we were riding we kept saying that there was no way we'd see everything if we had to walk it. Plus, it was FUN! Our tour guide, Emily, was as sweet as she could be and gave us lots of great information about each of the monuments we stopped to see. All in all we saw 8 monuments/memorials: the White House (I know, not really a monument, but we stopped there anyway), the Washington Monument, the WW II memorial, the Vietnam memorial, the Lincoln memorial, the Korean War memorial, the FDR memorial, and the Thomas Jefferson memorial. A crazy-fun way to spend an evening! I only have one word for you: Grayline. Or is it two words? Gray. Line. Our second day got off to a slow and frustrating start because we wanted to do a double-decker bus tour, but when I asked the front desk people at our hotel if they could sell us tickets (I had bought them there a year earlier when I was there with my sister, so I thought this was a possibility), they said they weren't selling them anymore. Then the strangest thing happened. The bellman, who had overheard our conversation, asked me if I needed bus tour tickets. Him: Were you looking for bus tour tickets? I can help you with that. Me: Really? The guys over there (pointing to the front desk only 10 feet away) said you didn't sell them anymore. Him: I can sell them to you. Me: (with a confused shrug of my shoulders) O.K. Him: You pay me half now, in cash, and you pay the other half when you get on the bus. So I buy five tickets and head to where he said was the bus stop. One hour and a little stressful family time later, we were all back in the hotel lobby. Him: What happened? Did you find the bus? Me: I need my $64 back. The bus never came. Two Grayline busses came and picked people up, but your bus company never showed up. Me: Really. May I have my $64 back, please? We're going to do something else. I know, write "gullible" across my forehead. Anyway, we decided that we'd take the Metro to Arlington National Cemetery and after we were finished there we'd try to find a Grayline bus. Our plan worked. Arlington was great, but it was HOT that morning and our girls really weren't that interested in a bunch of gravesites. Not even if they held JFK himself. It was just too hot to really appreciate Arlington the way we should have. Thankfully, we had the foresight to purchase Tourmobile tickets, so we rode most of the way around. That seems to be the way to do it. After Arlington we did indeed find the Grayline bus just outside the gate. As we got on the bus, I handed my Visa card to the driver who said, "I just don't have time to do that right now. Go get a seat and pay on your way out." We headed upstairs to get a seat in the sun because we just weren't hot enough after our morning at Arlington. But, actually, when the bus was moving it wasn't so bad--kind of like riding through a sauna at 30 miles per hour. We rode about half of the route and decided to get off the bus at Union Station to have a little look around and to get cooled off in the air conditioned building. As we were leaving the bus, I handed my Visa card to the driver again to try to pay for our tickets. She then said, "You know, I can't do that right now. Why don't you just pay on the next bus? Consider this a free ride." O.K. A free ride. Cool. Union Station was cool--in many ways. The architecture was beautiful. The train station part was fun. But the McDonalds had sweet tea, and that was just about all I needed at that moment. After a nice respite, it was time to continue on the bus tour, so we headed outside and got on the next Grayline bus. Once again, I handed my Visa card to the driver to buy our tickets. At least this time she told everyone else in my family to go get seats while she dealt with me. I'll give her this: she tried. She really tried. But after about 5 minutes of her Visa machine not working she said to me, "We need to get going, so why don't you just go sit down? I'll get you later." Alrighty then. I'll just go sit down now. We finished most of the loop, but this time took considerably longer than the first half did because traffic in that city was, in a word, HORRENDOUS!!!! I nearly went batty sitting in that traffic on top of a bus in 100 degree weather. But still, it was a good way to get a feel for the city. I do love a double decker bus tour. But here's the funny thing . . . nobody came to make us pay. I kept my Visa card handy, hoping that the assistant on the bus would figure us out and come get my payment, but nope. Nobody did. So we finished the tour and got off the bus near our hotel. It was a long, hot afternoon, but at least it was FREEEEEE! O.K., this is getting long, so I'm going to call it a day. Next Tuesday you'll get the last two days of our trip, so come on back then. 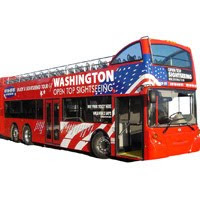 I, too, do love a double decker bus tour! Unfortunately, I've never had one for free. We spent so long sitting in the traffic in the Tourmobile that we got off near the Capitol and walked to Jefferson Memorial and beyond. It was not the highlight of our trip either.